Heat oven to 350°F. Spray 8x4- or 9x5-inch loaf pan with cooking spray. In large bowl, mix all ingredients except Buffalo wing sauce. Add 1/4 cup of the Buffalo wing sauce; mix well to combine. Press mixture in pan. Bake uncovered 1 hour to 1 hour 10 minutes or until meat thermometer inserted in center of loaf reads at least 165°F. Carefully drain meatloaf. Let stand 10 minutes. Pour remaining 1/4 cup Buffalo wing sauce over loaf before slicing. Serve with a simple salad with blue cheese dressing. 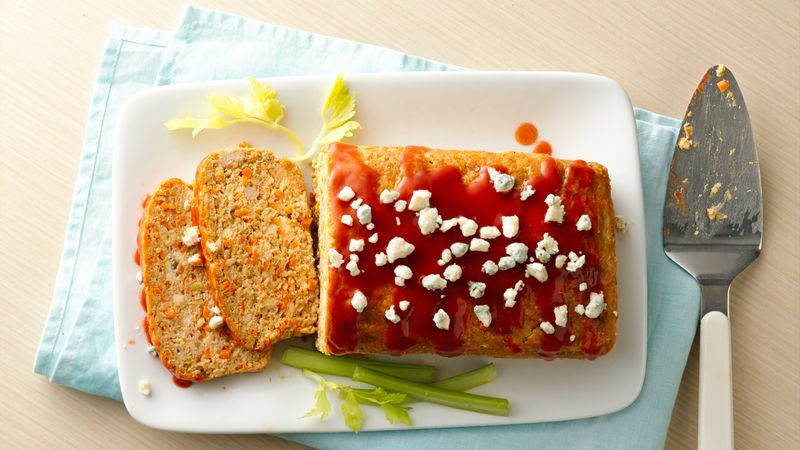 If you omit the extra Buffalo wing sauce on top, this meatloaf is not all that spicy and would be fine for most children. To make an even milder meatloaf, omit the sauce on top and add 1 tablespoon Buffalo wing sauce and 1/4 cup ketchup to the chicken mixture. Ground chicken breast can be used in this recipe to reduce fat content, but the end result will be drier.